Unique bath using Sagae-shi special product, rose causes reputation. Scene that rose floats in bath of fair skin effect feels having been contented until heart with beauty, sweet fragrance very much. 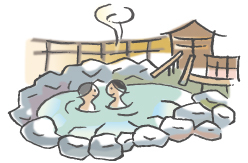 There are a variety of spa facilities including Sun return hot spring, footbath rose bath. It is 100% natural bath flowing constantly from the source. You can enjoy rose bath in cooking inn Yoshimoto (�: 0237-84-2138), two places of Hotel symphony annex (�: 0237-83-1222). As batheable periods vary according to facilities, please refer beforehand by all means.